Like a shotgun blast of color, American DJ’s Double Phase LED gives DJs and club owners the range and power to cover a large area of any entertainment venue with a rainbow of bright, animated LED lighting effects. 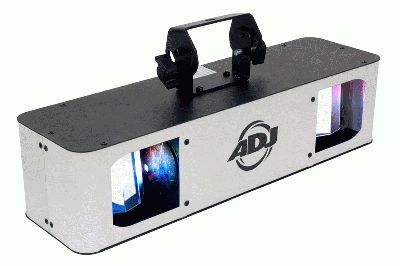 This exciting dual barrel mirrored effect is powered by two CREE 10-watt Quad Color LEDs that create thick, twin beams of light in a variety of eye-popping color combinations. Each of the Double Phase LED’s two high-output LED sources actually has four different color LEDs (Red, Green, Blue and White) inside of it. All color mixing is done within each LED lamp prior to output, which allows this amazing unit to produce a smoother blend and generate a wider spectrum of blazing colors. The Double Phase LED’s perfectly synced dual barrel mirrors magnify and amplify the beams to dazzling proportions — so it can easily accommodate any nightclub, roller rink, bowling alley or party tent in need of an exciting, professional-caliber light show. What’s more, it comes equipped with an LED strobe that adds pulsating flashes of color, allowing users to crank up the excitement level even higher. Add the unit’s 0-100% dimming, 150° beam angle and hypnotizing built-in programs, and you’ve got all the tools you need for a knockout LED lighting experience. The Double Phase LED offers numerous advantages that make it ideal for users of all levels of lighting experience. It can be operated in three different modes: Sound-Active, Master-Slave, or DMX-512 (6 channels controlling dimmer/strobe, color and roller speed, and rotation). When in Sound-Active or Master/Slave modes, it runs as a simple plug-n-play effect, moving to its own internal programs. In addition to full DMX control, the unit is also compatible with American DJ’s easy-to-use UC3 controller (sold separately), which can be used to turn the unit on/off and navigate through the various settings. Up to nine Double Phase LED units can be linked together via the unit’s IEC AC in/out connectors, to cover spaces and venues of all sizes. Other user-friendly features include an easy-to-navigate four-button DMX LED display located on the rear panel. The Double Phase LED also comes with a hanging bracket and safety hook for worry-free mounting. Maintenance worries will be kept to a minimum as well, since the unit’s long-life LEDs have a rating of 30,000 hours and virtually never need replacing. For all its visual excitement, the Double Phase LED consumes very little energy, drawing just 40 watts of electricity at maximum use. It can run all night without duty cycles, thanks to its ultra-cool operating temperature. The Double Phase LED includes multi-voltage operation: AC 100V-240V, 50/60Hz. Designed for easy portability and packing an amazing punch for its size, the unit measures 19"L x 7.75"W x 5.25"H (478 x 194 x 134mm) and weighs only 10 lbs. (4.5kgs). The MSRP of the Double Phase LED is $299.99.